Twitter to Automatically Highlight the Live Streams of Accounts You Follow — CROWD. but has faced significant challenges in the way of announcing content and boosting discovery options. Letting people know what’s on and how they can tune in is, of course, a crucial step in getting eyes on video content. if they followed the account responsible for creating it— like the select WNBA gaves Twitter broadcast live during the most recent season. Those who followed the WNBA handle were consistently made aware of the streams, but those who didn’t missed out. It’d be easy to say that users who wish to have more exposure to certain content creators should just follow the relevant accounts. However, that’s not an ideal solution, given that some accounts might be of interest to a user in their videos, but not in their tweets. If Twitter’s really looking to maximize viewership, the platform needs a shorthand way to give people a consistent and quick rundown of what’s being broadcast at any time, from any user. Their update isn’t a full solution to this discovery problem, but it is another arrow in their quiver of live content availability options. The announcement of automatic broadcasts at the top of your feed from accounts you follow is good news, and will doubtless get more people watching. Unfortunately, it’s still not sufficient from a discovery standpoint. 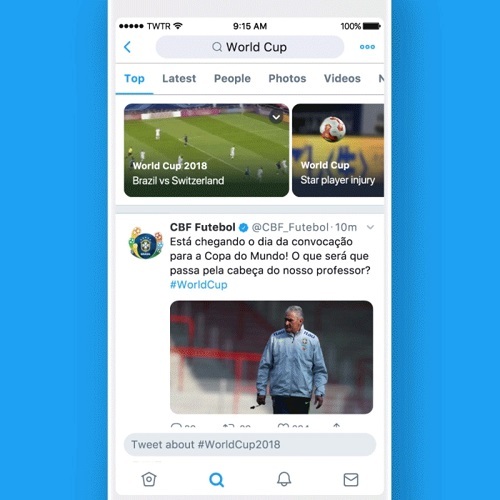 Twitter has tried some other options in this arena, like the ‘Topic Tabs’ they added to the Explore page back in June that highlight trending conversations and occasionally include live streams too. But as of yet, the platform hasn’t been able to nail down live stream discovery the way some other social media sites have. The announcement of the new format is a clear indication that Twitter is aware of,the issue and taking steps toward tackling it. For marketers, it has particular significance— if live-streams occupy a more prominent space in the app screen, it could be a more appealing option for advertisement opportunity. If live streams are sure to reach follower’s eyes as soon as they open Twitter, then generating messages through this format is a solid way to get people interacting with the content. One thing that is certain is that we can expect to see more live-stream content notifications in our Twitter streams moving forward, a development we will be literally and figuratively keeping our eyes on. To keep up with current social media trends, visit CROWD. or send an email to our team, at hello@crowd.agency.